This is another walk where I used the bus to reach the starting point at Llanuwchllyn (buses every two hours on the Chester-Bala-Dolgellau-Barmouth route). It's a long walk back to Dolgellau but not significantly longer than an out and back walk from Llanuwchllyn to Aran Fawdwwy. 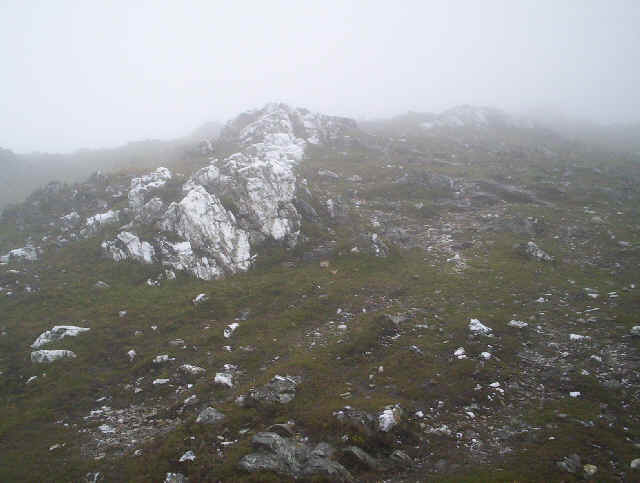 It's a very varied walk but, sadly, in August 2008 the weather was very poor with no views once I was above about 2000 feet and some of the wettest conditions I've every experienced. It was so bad that condensation appeared inside the lens of my camera preventing me taking any photos in the later stages of the walk. Leaving Llanuwchllyn the way passes through farmland to gain the ridge. 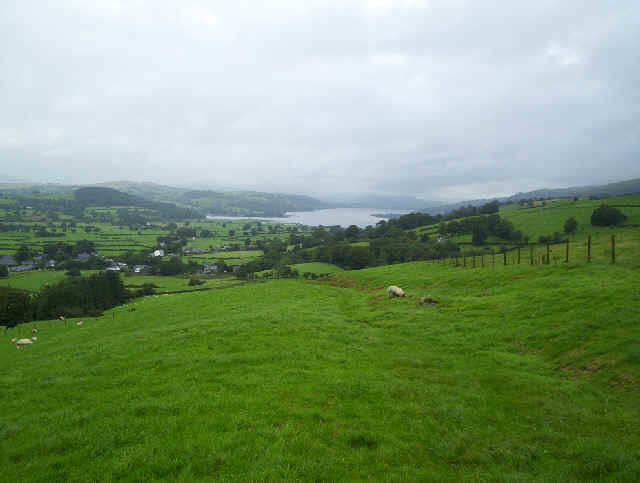 In the background is Llyn Tegid, probably better known as Lake Bala. Once up on the start of the ridge the path follows a fence almost the entire way, a most useful feature in the misty conditions I experienced. 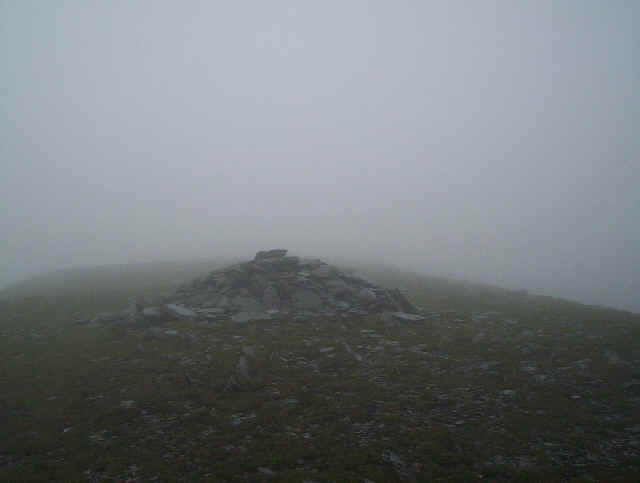 Here the summit of Moel Ffenigl is the first significant feature encountered. Looking back down the ridge towards the lake. 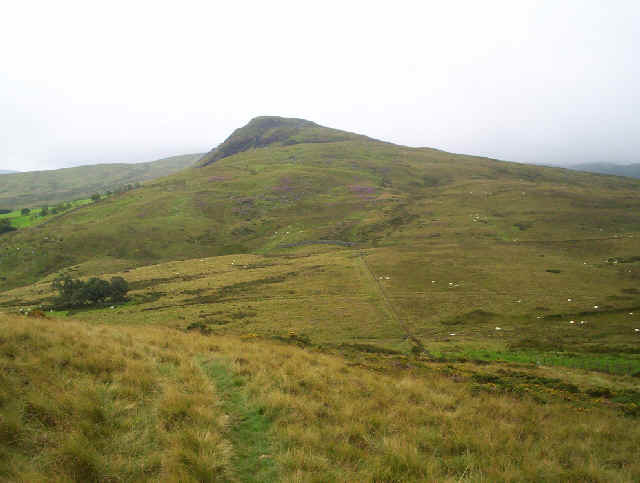 The peak of Aran Benllyn is notable for the outcrops of quarzite on its northern side. 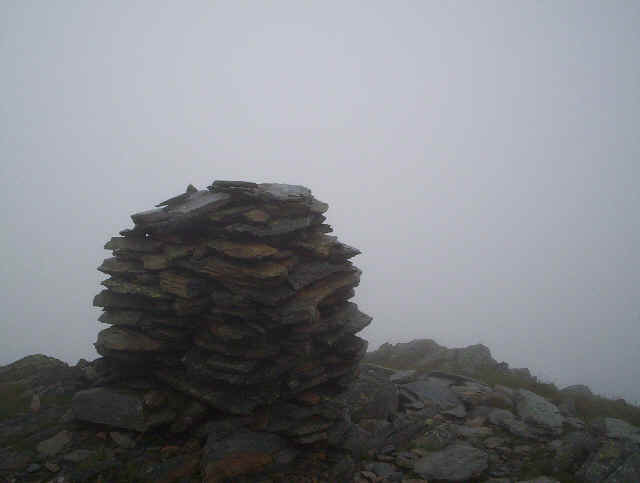 The cairn on Aran Benllyn. Pity about the view! It wasn't the best lunch spot I've chosen but at least there were some large boulders to lean against. 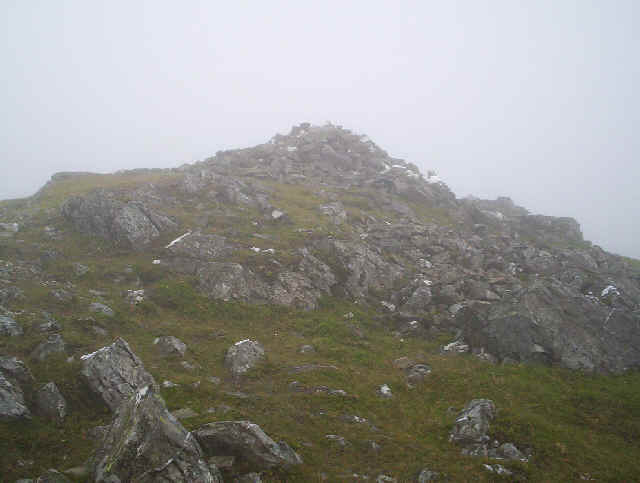 There's quite a steep climb over boulders to the summit of Aran Fawddwy with its pile of boulders marking the summit. 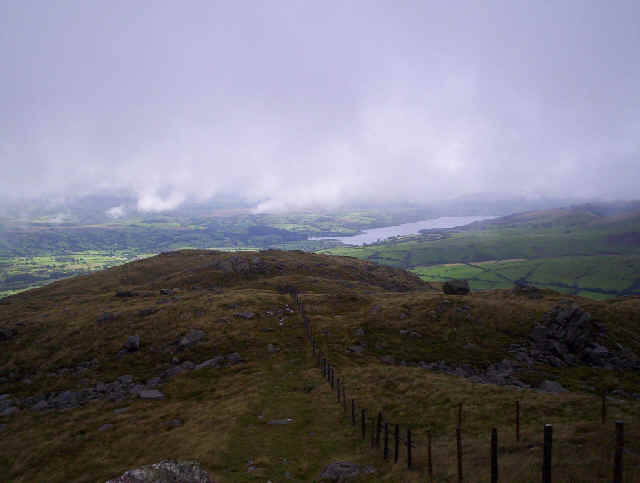 To the right is the steep drop down to the lake of Creiglyn Dyfi a thousand feet below, or so the map tells me. A little further on is this amazing cairn perched on the edge of the cliff - it was erected, I believe, in memory of a member of a mountain rescue team who was killed in a thunderstorm. Beyond lies the precipitous drop. Returning to the fence I followed it as it meanders south-westwards. Somewhat confusingly I found that not all sections of the fences were marked on my OS 1:25000 map - perhaps I need a more up-to-date version. Given the conditions I was using both my GPS and compass to locate exact positions on the map. Beyond Aran Fawddwy the paths and fences split with one going towards Drysgol and the other towards Waun Camddwr. Taking the latter path it was interesting to see enormous stretches of duckboard planking crossing the marshy ground. When I came to try to take photos in the later parts of the walk I discovered that condensation had formed inside the lens of my camera. This more than anything else emphasised how awful conditions were that day. Eventually, the ridge path meets up with a track coming up from Dinas Mawddwy. Turning right it descends under the north east side of Glasgwm to reach the Coed-y-Brennin forest. To get to the forest requires crossing the Afon Cwm-ochr which took some time given the amount of water in the stream. Eventually a safe place to cross was found and I was soon heading down through the forest. At a large triangular clearing I turned towards Dolgellau and took a lane that after about half a mile or so left the forest. This turned into an extremely muddy track until eventually it met the paved lane described on the OS map as a Roman road. Using my GPS I was able to predict my arrival time in Dolgellau as 18.45 which proved to be slightly later than I actually arrived. Progress along the paved lanes was swift, although I was very conscious of my water logged socks and boots! After the village of Brithdir there was a short section walking along the B class road before reaching the beginning of the famous Dolgellau Torrent Walk. Heading down through the woods it was clear that conditions underfoot were very poor and that a slip in places would have resulted in a rather long fall down to the torrent! Clearly sections of this path are in need of attention, especially if wet summers become more frequent. Soon the bottom of the walk was reached and then it was a simple matter of heading off along the verges of the main road back to Dolgellau. From Llanuwchllyn it had taken nine hours and was a truly memorable walk! !